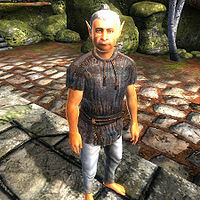 Fimmion is a hungry Bosmer commoner living on the streets in Bliss, New Sheoth. He has the Calming Pants, one of three items that Ahjazda asks you to retrieve for her. Fimmion also claims to have an "idea" about where Amiable Fanriene can sleep outside. In both cases, Fimmion will request his favorite dish, a sweetroll. His bedroll and food sack can be found behind Amiable Fanriene's house and he sleeps there every night between 10pm and 6am. Immediately after waking up, he enters the Sacellum Arden-Sul for an early two-hour prayer then positions himself at his favorite spot near the entrance to Crucible. He will spend the entire day here, occasionally asking the patrolling Golden Saint for food. At 6pm he finds a place to sit and enjoys a quick dinner. He returns to the gate at 8pm where he strolls sleepily around until his bedtime. Besides the Calming Pants, Fimmion wears a sack cloth shirt. He also carries a tan cup and a random piece of food. Fimmion is infected with the disease ataxia and can pass it on to you if engaged in combat. When Fimmion sees someone approach him he will greet them by muttering about food; "No apples. Don't like apples. Got mutton? Fritters?" Speaking to Fimmion will occasionally have him greet you by requesting that you give him food; "Fimmion hungry. Got food? Sweetcakes? Sausages?" When you end a conversation with Fimmion he will occasionally claim that he will go searching for food; "Fimmion gone. Bye bye. Go find pumpkin." "Sweetroll good. Fimmion give pants." Asking him about the Calming Pants that Ahjazda requested you obtain from Fimmion will have him reply; "Fimmion hungry. Want sweetroll. Fimmion like pants. Love sweetroll." If you don't have a sweetroll he will tell you that the pants are yours if you can get him one: "Fimmion hungry. Sweetroll for Fimmion. Pants for you." If you have a sweetroll, but don't want to give it to him he will refuse to give you the pants; "Fimmion sad. Want sweetroll. No pants for you. Fimmion hungry." If you have a sweetroll and agree to give it to him he will gladly give you his pants in return for the pastry: "Sweetroll good. Fimmion give pants. Got pie? Apples? Fimmion hungry." If he hands over the Calming Pants, Fimmion will from then on walk around town in his underwear. Nobody seems bothered by this, least of all Fimmion himself. If you ask him about a location for Amiable Fanriene to sleep outside he will claim to know a place for him too sleep, but will demand payment first; "Yes? I have idea for you. But first sweetroll for Fimmion. Sweetroll for Fimmion, idea for you! Saa-WEET-ROOOOLL!" If you refuse to give him a sweetroll he will be angry, and refuse to help: "No sweetroll for Fimmion, no answer to problem. Hrmph." If you offer him a sweet roll he will assist you by providing information about Uungor and his missing glass grapes; "Sweetroll for Fimmion. Yummy in tummy. Answer for you. Problem solved. Uungor, he say no crazy. But he is. He say he going. Away. Far. Your friend sleep there when Uungor goes. But Fimmion no think Uungor really leave. You make Uungor go away faster. He won't leave without his lucky grapes. Can't eat them. I tried. Give back to him. If he still no go, make Uungor crispy with fire spell. Then glaze. Then eat him like a giant sweetroll. Saa-WEET-ROOOOOLL!" Giving Uungor the grapes will cause him to say: "I've been looking for those. I thought Fimmion stole them thinking he could eat them, but I could never prove it. Thank you for returning them." The Coming Storm: Help Ahjazda prepare for the storm. If Fimmion is for some reason killed, his tombstone will read, "Fimmion died hungry. Or at least he thought he was." This page was last modified on 28 February 2018, at 23:41.